Russian watches have a certain mythical quality. In fact, the former Soviet Union was once one of the major players in the watch industry. However, social upheaval brought about radical change and the new era was followed by a period of economic recession. As older companies disappeared, new ones emerged to take their place. One of these is Maktime, which brings together the expertise of former leading Russian watchmakers. UHREN-MAGAZIN went to visit the manufacturer in Moscow. 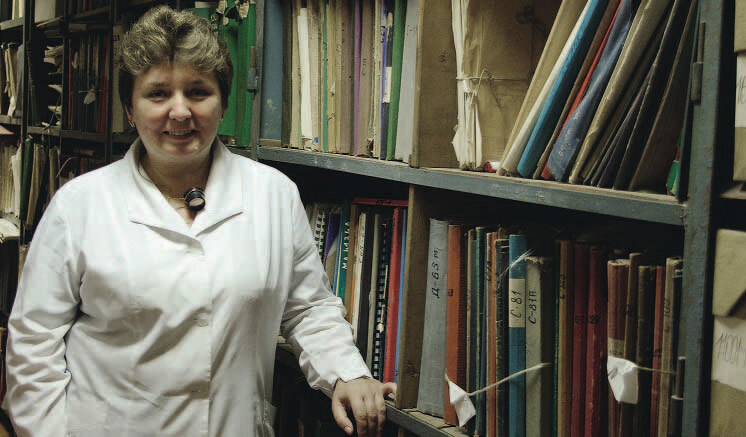 The process for gaining access to the Russian watch industry is very different from a visit to a Swiss manufacturer, or even the luxury German watchmaker Glashütte. For starters, you need a visa, which can only be obtained if you receive an official invitation from the manufacturer and have a hotel reservation confirmed in writing. who founded the watch factory with his brother in 1996.
a city that lies several hundred kilometres to the southeast of Moscow. By this time, the factory was already inactive. Maktime relaunched production and the company started manufacturing models such as the 1509, 2009 and 2014 three-hand movements at this site and then, later on, parts for the 3133. Maktime acquired equipment and staff from both Poljot and Zarja. Today, the company has 700 employees, 350 of which work at the original site in Moscow, while the other 350 are based at the Penza factory. 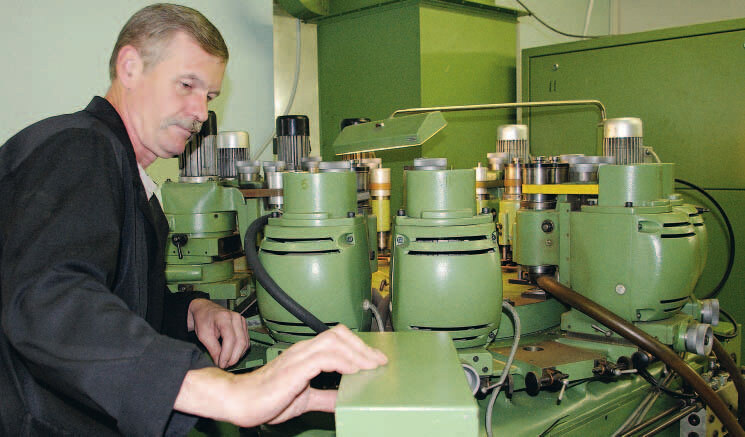 In 2006, Maktime also acquired shares in the Second Moscow Watch Factory (Slava). However, production is currently on hold here, although several members of staff have found work at Maktime in the Russian capital or in Penza. 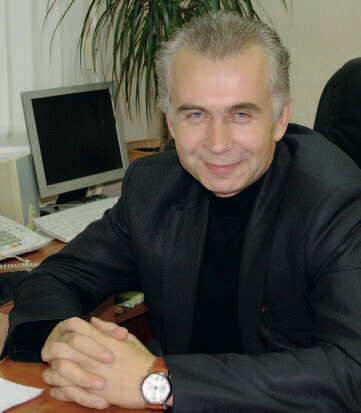 According to Alexander Makarov, the company currently manufactures around 100,000 watches and 90,000 movements per year. Whereas the timepieces themselves don’t tend to be sold outside of Russia, Maktime also receive orders from abroad for its watch movements, for instance from countries such as Germany, Portugal, Holland and Italy. The company also supplies Russian brands with watch movements, with examples including Buran and Aviator. However, you are currently unlikely to find Poljot as a brand name, as Maktime did not inherit this from the First Moscow Watch Factory, much to the company’s regret. It actually belongs to a renowned Russian money oligarchy. Alexander Makarov explains how attempts to secure the trademark rights has so far been unsuccessful. However, he also says very little about the news that the owners of the trademark want to start producing in Switzerland under this label. So, the iconic Russian calibre is still produced by Maktime, but now bears only the number 3133 and not the Poljot name. Maktime has acquired the machinery needed for this. There are also several different variations, for instance the 31682 has a 24-hour display and the 31679 features a moon phase dial, while the sleek 3105 model has no chronograph movement. benefits from years of experience and has full control over her department. Maktime also worked on developing an automatic calibre between 2006 and 2008. This model, known as the 30664, has been designed to resemble the ETA/Valjoux 7750. However, the economic crisis has thus far prevented it from being put into production, although there are now plans to start producing it in the coming year. The facilities for this new model are ready and waiting at the former Slava production site. The manufacture of some 3133 calibres has changed so dramatically that it is barely recognisable. On a tour through the production area, Production Manager, Tatjana Malik, proudly shows me “her little darling”; a range of 3133 movements with rhodium-plated, blackened or gold-plated bridges and plates, frames and set stones – everything you can possibly imagine! 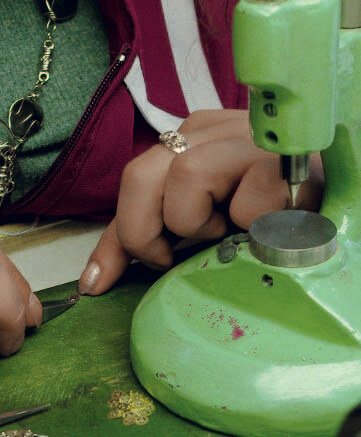 It is incredible to think that such delicate work can be carried out amidst the rumbling of passing freight trains. But Tatjana has more to show me. Behind a mysterious door bearing the sign “Sborka Usla Balansa” we come across an area where staff assemble balance wheels and manufacture the spiral springs. 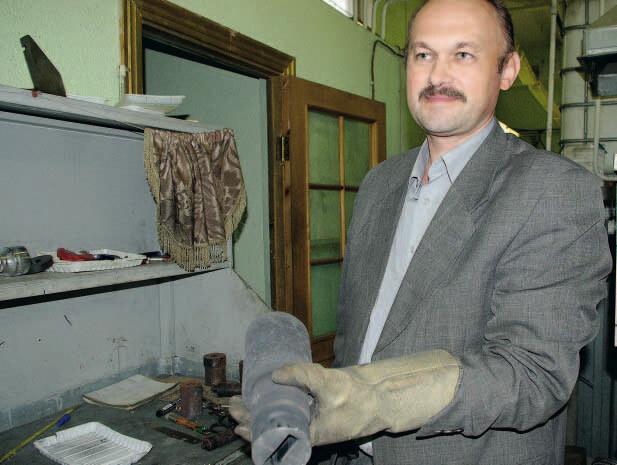 Michail Korin:Manager of the state-of-the-art case production area, where the process begins with casting the raw materials. Even the adhesive, which is used to fix the thin wire to the balance wheel, is developed here. In fact, Maktime produces almost everything in-house, apart from jewel bearings and main springs, and also boasts a highly skilled tool shop. 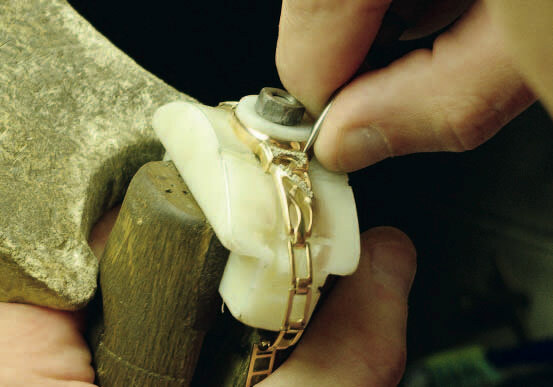 Finishing: Decorating cases and straps with beautiful stones is one of the many skills at the Maktime factory. Wheel production:There are a number of different stages to forming the gear train. The wheel, pinion and arbor are being combined here. Setting stones: Jewel bearings are one of the only components that are not produced by Maktime. Swiss heritage: These machines have changed hands twice already and were once used to make parts for the Valjoux chronograph calibre 7734. However, it’s a completely different story in the case production area and it’s obvious that this part of the business is where Makarov’s heart lies. 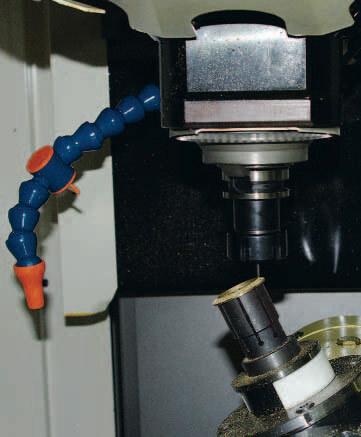 Here, modern CNC machines process gold, silver, stainless steel and sometimes even titanium. 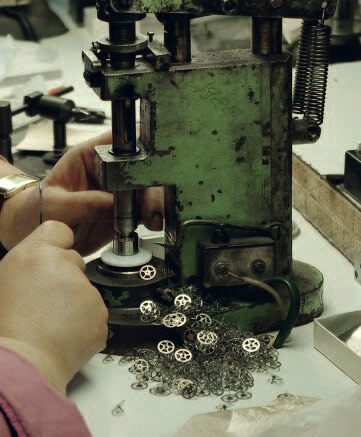 Yet, at Maktime, the manufacturing process begins much earlier than this, with the casting of the raw material; another rarely observed process at watch case manufacturers. Once casting is complete, the material is then rolled, relaxed, stamped, twisted and milled. In addition to cases, all types of metal wristbands are also made here. This part of the business works closely with the design department, mainly to produce valuable one-off items. The designers also create watches decorated with jewels, so goldsmiths are kept busy adding fine gem cuts and engravings and setting valuable precious stones. Whereas unique pieces such as these can easily cost 20,000, 30,000 or 50,000 dollars (in fact, the “Crest of the Roman Empire”, a fully diamond-encrusted timepiece, can bring the cost up to 70,000 dollars), most Maktime watches range in price from 6,000 to 90,000 roubles, at a rate of 40 roubles to one euro. However, the company is less interested in gaining a position in the luxury goods market and more concerned with developing the business internationally. Alexander Makarov believes that the German market is absolutely essential for this and is therefore working actively alongside several partners on various projects, one of which involves the development of a horological complication. But he also supplies watch movements and individual components, for instance those used for the balance wheel, to various different companies. Time today now truly stands still for the Russian chronograph production. The time and cost intensive production of the famous Russian 31mm chronograph calibers stopped on 01/01/2012. A sad phase to Mr. Makarovs dream to continue and extend this horological heritage. We really bow low for his courage to try and give his best in this mission and thank for a longstanding partnership. You can still find MakTime under the following domain: maktime-shop.ru.